American Hero works due to the strength of Stephen Dorff's portrayal of a lovable loser, even if some of the decisions made by the filmmakers don't support it. Melvin (portrayed wonderfully by Stephen Dorff) is a party animal still living with his mom and sister in New Orleans. Divorced from his wife and longing to see his son, he spends most of his days hanging out with his best friend Lucille (Eddie Griffin), a fast-talking, wheelchair bound veteran. The movie opens with Lucille finding Melvin passed out in a parking lot after a long night of booze, drugs, and women, the final nail in the coffin that could prevent him from seeing his son again if he misses his court appointment. Oh wait… did I mention that Melvin’s telekinetic? Well yeah, there’s that too. In what seems to be public knowledge to most of the community he lives in, Mel has the ability to move objects with his mind, something he occasionally does for fun or to make some quick cash. You’d think that this would be the focus of the movie, and while it’s what certainly caught my interest, it’s not nearly as important as what it represents. American Hero is a story about a guy who has great potential and squanders it. In the movie, it exists as Melvin’s telekinetic ability, but what it truly represents is the potential that every person has. The idea that it doesn’t matter what skills you possess or how intelligent you are if you lack the motivation to put it to use. Melvin lives in a post-Katrina, crumbling neighborhood infested by drug dealers and does nothing about it until a near-death experience invigorates him with a new sense of purpose. The greatest successes of the movie are both delivering this message without getting needlessly deep and watching Stephen Dorff guide us there with his portrayal of Melvin. Dorff is fantastic in this role, showing a man hitting rock bottom and believably rising to meet his calling. While Melvin is certainly not without humor, Eddie Griffin’s Lucille keeps things even lighter, providing the comedy relief while often being the emotional crutch for Melvin to lean on. A questionable decision by director Nick Love is that of taking a documentary-like approach with the presentation, one that presents itself randomly at times while seemingly being forgotten at others. There’s never an explanation as to why the documentary crew is following Melvin and Lucille, or why they would be OK with a larger audience seeing the resulting doc about Melvin and his abilities, especially when he refuses to visit hospitals because of them. 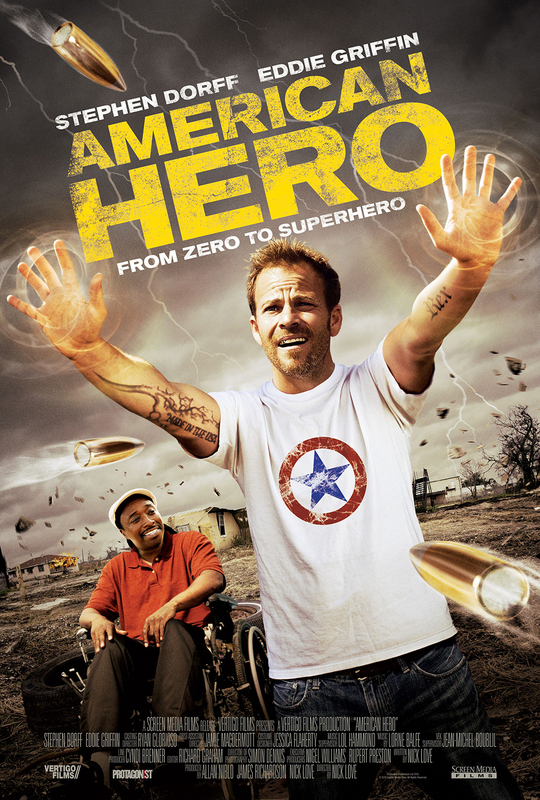 American Hero works due to the strength of Stephen Dorff’s portrayal of a lovable loser, even if some of the decisions made by the filmmakers don’t support it. If you’re looking for a superhero action-fest, look elsewhere. But, if you’re looking for a lighthearted tale of one man’s fall and redemption, with a touch of telekinetic badassery, American Hero is well worth your time.